We’re pleased to announce a new Rotor Transition Program (RTP) to help military pilots make the transition to a civilian aviation career. By using Veterans Administration (VA) benefits and Envoy funding, former service members can take advantage of the reduced ATP minimum flight experience requirement of only 750 total flight hours. Pilots will obtain the necessary fixed wing experience and flight ratings at Envoy’s partner flight school, Coast Flight Training in San Diego. Once airline minimums are reached, pilots are eligible for the company-paid ATP-CTP course and receive up to $22,100 signing bonus on their first day of new hire training. Combined with industry-leading starting pay, Envoy First Officers can earn nearly $60,000 during their first year. And with its unmatched flow-through agreement with American Airlines, Envoy offers a direct path to fly for the largest mainline carrier in the world. 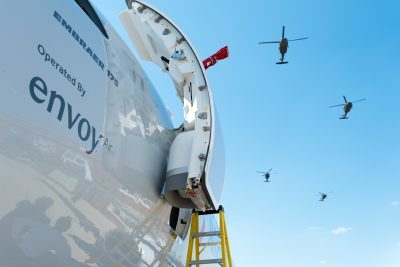 Pilots who flow through from Envoy to the mainline make up half of every American new hire class – in fact, more than 60% of American’s new hires since 2013 came from Envoy. American receives thousands of applications from qualified pilots, who are vying for less than 150 positions they plan to fill “off the street” this year. Envoy’s guaranteed flow means our pilots have a direct path to the world’s largest airline – without having to interview with American or compete against all those other applicants. Military pilot? Send your resume to envoy.rtp@aa.com and a recruiter will respond with information. Or, call 972.374.5607 for details.